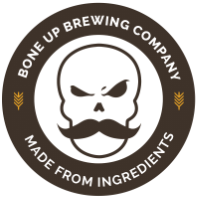 Stats: Showdown - Bone Up Brewing Co.
Color: Mostly black, with hints of dark brown around the edges if you hold it up to the light and squint and maybe use your imagination a little. Cheese Pairing: Shredded cheddar (ideally on top of chili, alongside some sour cream). Music Pairing (Jared's Choice): "Brunette" by Dead Now. Best Occasion to Drink: Chili! Cook! Off! Brewers' Notes: A little ways back, we met up with our food pals from Brato and Bonetown Burgers and made the group decision that the world needs more a) chili, and 2) made-up rivalries. And thus, The Showdown was born: pitting these chefs against each other to settle a longtime grudge! And anyway since we're hosting the dang thing we figured we'd be remiss if we didn't brew up some special beer for the occasion, so we did just that! The Showdown is a solid session-strength milk stout with a buncha chili flavor but only the littlest dab of heat - perfect to wash down several bowls of chili that were born of fierce competition between bitter rivals.